This blend of 65% Grenache, 31% Syrah, 4% Mourvèdre shows ripe blueberry and red raspberry with raisin undertones and black pepper top notes. Freshly turned earth becomes more of a focal point with aeration, an attractive nose although the alcohol is distracting. A juicy, sweet and spicy palate, like cinnamon inflected chocolate candy, it features a medium plus body with some persistent cedar carrying through the finish. It’s evolution is quite linear but consistent from front to back with a medium length finish that shows black licorice on the back end. Tannins are soft and acidity just barely sufficient. Designed to be a crowd pleaser, this delivers value for the price if you don’t mind the candied notes. It paired well with a Cassoulet. A perfect wine to sip while listening to Sade, confected and pretty but likeable anyway. 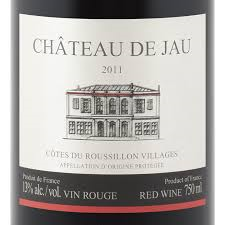 Nestled in the foothills of the Pyrenees in the South of France, Côtes du Roussillon-Villages is a red wine sub-appellation of Roussillon. Roussillon is famous for its sweet wines—Rivesaltes, Banyuls, and Maury. For still wine it struggles to get out from under the shadow of the better known Rhone region in the very competitive global wine market. Quality red wines from this region are relatively rare in the U.S. Although the region is warm enough to produce fruit-forward wines in a modern style, the traditional style is more austere with distinctive earth and herbal fragrances and a rustic character. The Chateau de Jau has one foot in each camp. Dark berry aromas with layers of baked earth and thyme that turns to refreshing mint notes over time, the nose is a bit closed but will open up with aeration. Very juicy with fresh, dark red fruit on the palate, it appears lush on entry but adds bitter herbs with bracing acidity midstream, with a dry, medium-length finish. Medium-plus acidity and fine-grained but persistent tannins make this a good everyday drinker that will go well with a variety of foods. If you’re tired of the sweet, spofulated wines with no structure or character that you find in the supermarket, this wine will satisfy. I suppose it’s inevitable. When we think of pleasure we tend to think in terms of quantity. The more the better. Wines that give the most pleasure are big wines with more power,more body, more flavor, more intensity, greater length. These are wines that get big scores; they stand out in a comparative tasting because they are easier to notice, they have impact, they announce themselves. You don’t have to think about them; you just drink and say wow! Of course this is a big mistake. Pleasure doesn’t work that way. We get satiated. Too much of a good thing becomes tiresome and loses its ability to satisfy. A true life of pleasure is one that can take pleasure in small things, that is sensitive to finesse as well as power, delicacy as well as richness. So it is with wine. The more I drink the more delicacy and finesse matter. It’s a shame that our obsession with wine scores doesn’t capture this dimension well. How do you quantify finesse or delicacy? I have yet to figure that out; even my wine scores reflect a prejudice toward power and big flavor. 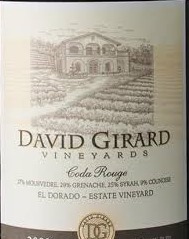 This is why I like to give recognition to wineries such as David Girard Vineyards in the Sierra Foothills. Their Rhone-style blends all strive for a light touch and restraint that is as satisfying in a wine as it is in a person. This is not to say their wines lack flavor. To the contrary, their wines are lush but they don’t sacrifice elegance to achieve power and they maintain acidity levels so they complement a variety of foods. 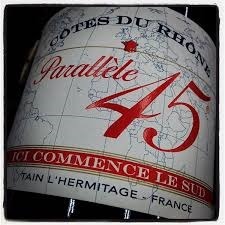 The Coda Rouge is a blend of Grenache (50%), Mourvedre (26%), Syrah (17%) and Counoise (7%). The nose opens with the characteristic raspberry jam from the Grenache, but the Syrah provides enough warm spiciness, clove and vanilla, to keep the jam in the background, so hints of anise are allowed to show. The palate turns a bit darker, almost cola like, that leaves the mouth tingling from a burst of tangy acidity that carries through the medium-length finish. A medium body wine with soft, delicate tannins, this is a lovely wine that will not knock your socks off—it will just satisfy in the way a Mozart sonata or a walk in the park can satisfy. In 2010 I was on an Insider’s tour of Paso Robles visiting the Denner winery when we were invited to taste pre-release wines from an upstart—Epoch—a new label with only one vintage under their belt. The winemaker, Jordan Fiorentini, was young, charming and enthusiastic about her wines. The wines were young, raw, and full of sharp edges, not yet ready to drink. But even in that infantile state you could sense power and depth and an ineffable mysterious quality that great wines have. So I took a gamble and got on their allocation list hoping that age would be kind. It’s 2013, time to see how they are progressing. The Ingenuity is a flat-out terrific wine. Like a young beauty on the way to a party, it is all fresh exuberance but with the elegance of a mature wine beginning to show as the rough edges have softened considerably. Dark berry aromas accented by black pepper leap from the glass but smoke and earth emerge as the wine evolves, all encased in subtle, sweet coconut from the 22 months in French Oak, 32% new. The mid-palette is tender, round, and smooth despite the intense, concentrated fruit and ample acidity. 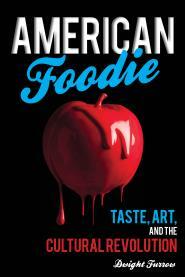 The flavors persist through the long, beguiling finish. A wine of intensity and grace, it has definitely entered its drinking window. Although it should be fine for 6-8 years I would drink it earlier rather than later—its freshness is not to be missed. 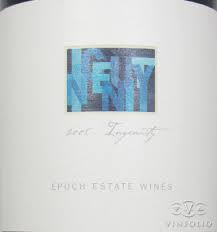 Epoch specializes in Rhone blends although they make some Zinfandel and Tempranillo as well. The Ingenuity is 61% Syrah, 17% Grenache, 14% Petite Sirah, 8% Mourvédre harvested from the highly regarded Paderewski Vineyard. The 2008 is probably difficult to obtain but the 2009 and 2010 are available. When you get right down to it, wine is interesting because wine grapes contain chemical compounds that are also found in other fruits. Fermentation makes these compounds more prominent so the finished product smells like apples, fig, or blackberries, etc. Oak will add spice, a little age will add earth and you end up with something really complex and fascinating. But there are lots of other compounds, sometimes found in the grapes or produced in the winemaking process, that produce less appealing aromas—rotten eggs, band-aids, wet paper, burnt rubber anyone? Wines that emit these aromas are clearly flawed. But in very small quantities these compounds can be intriguing and add complexity. It all depends on how deftly they are handled. This blended wine from the South of France (likely Grenache, Syrah, and Mourvedre) has plenty of dark berry aromas and earthy undertones. But do I like that aroma of cooked cabbage that keeps lapping at the boundaries of sensation? There is lots of ripe fruit and vibrant acidity. The medium-weight palate has a warm, homey feel; the modest finish has a pleasing bitterness to it although it turns a bit sour as it evolves. But should wine ever remind you of cooked cabbage? Is this a flaw or does it add interest? It could be just a bad bottle—it is from a highly respected producer. So why write about this wine? Shortly after sampling the Bonfils, I joined some friends at a restaurant/bar with a small wine list consisting of affordable, readily available, big-name supermarket wines from California—a bar that does not take its wine seriously. Everything I tasted was sweet, fruity, round, soft, easy to drink. The Syrah sort of tasted like a Cab which sort of tasted like a Merlot which could have been a Malbec—in a word, generic and boring. For wine lovers just a little too sated by pablum, Stepford wives, or Justin Beiber I highly recommend this wine. And if you’re serving a hearty vegetable ragout from the south of France, it is perfect. I ‘ve just returned from viewing Baz Luhrmann’s The Great Gatsby, a morality tale about hopes and dreams that go awry if they lack restraint. Good wines carry a similar moral message. In-your-face power and bluster in a wine can be impressive at first but it wears out the palate and the jammy sweetness masks the subtleties that make wine intriguing. Good winemaking is about restraint and balance. The initial impression of this blend of Grenache (68%), Mourvèdre (18%) and Syrah (14%) is big and bold—blackberry and rhubarb aromas suggest a powerful fruit bomb. But with a vibrant burst of mid-palate acidity this wine turns shapely and supple on the palate. It feels full in the mouth but sits lightly on the tongue. Herbal top notes and hints of pencil lead provide some complexity. The finish lingers with soft tannins that are not drying. Big enough to pair with a robust meal but sufficiently refreshing as a quaffer, this is a versatile wine and an excellent bargain. The Santa Barbara region is best known for its Pinot Noir, but their Rhone varietals are equally impressive. 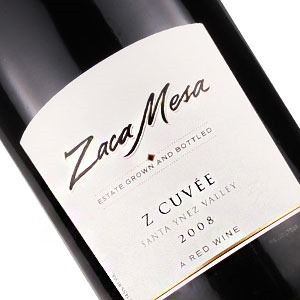 Zaca Mesa is one of the pioneers of Rhone varietals having fully committed to them in the early 1990’s well before they came into fashion. Sprezzatura! An Italian word, coined by Baldassare Castiglione in the 16th Century to describe the attitude and style the ideal attendant to the court should have. Castiglione describes it as “a certain nonchalance, so as to conceal all art and make whatever one does or says appear to be without effort and almost without any thought about it”. In other words—total mastery felt deep in the bones. It is, in part, what we admire in any performance. Milla’s Blend has it in spades. A fascinating blend of 57% Syrah, 22% Counoise, 14% Pinot Noir, and 7% Marsanne, this is as elegant as Syrah gets thanks to its blending partners and a deft hand with the oak. Lovely charred cedar with soft vanilla overtones introduces the nose displaced by black cherry and black pepper as the wine aerates. The fruit is rich but there is no hint of jam and nuances of eucalyptus keep vying for more attention. The evolution from secondary to primary flavors is surprising and interesting. The 33% new French oak (18 months) is just enough to get your attention without seeming woody or smoky. The complexity unfolds over time in the continual play of oak, fruit, and spice on the palate that keeps you absorbed from first whiff through the medium length finish. Possessing a svelte, medium body with silky tannins playing a supporting role, this wine exudes charm, clarity and focus. There is plenty of alcohol (14.5%), acidity, and concentration but nothing big or noisy to distract from the overall impression of balance as befits the experienced courtier who knows what the court likes and sets the perfect tone for any occasion. If balance and elegance turn you on, you will love this wine. 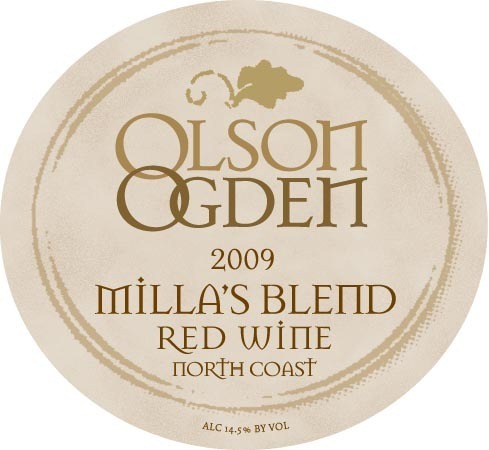 Olsen Ogden makes small-production wines in the Russian River Valley. Distinctive: Evolution of fruit and secondary flavors on nose and palate. 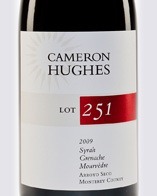 Price: $35 A good value for a distinctive wine. The business model for the Cameron Hughes Lot Series is a win for consumers. They buy surplus wine or wine grapes from good producers at low cost, make the wine if necessary, and sell it for much less than the wine would have cost had there been no surplus. So, when looking for bargains, it is usually worth paying attention to what Cameron Hughes is doing. 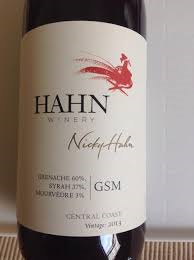 This blend of Syrah (51%), Grenache (43%), Mourvedre (4%), and Carignane (2%) is no exception. These grapes are sourced from Arroyo Seco, an often overlooked, cool weather appellation in Monterey County. I would expect Rhone varietals from this region to be restrained but with refreshing acidity, which is precisely what we find with Lot 251. Blueberry, strawberry jam, black pepper, fig and lightly roasted coffee notes show on the nose; on the palate these flavors are amplified by zesty minerality and a supple, crisp, almost delicate mouth feel. The aromas don’t leap from the glass—it is a bit reserved but there is plenty of complexity once you probe and ponder a bit. The clean, velvety finish has persistent flavor but comes up short for lack of tannins. Drink soon; it lacks the structure for extended ageing. A thoroughly enjoyable, refreshing, everyday wine at an affordable price.